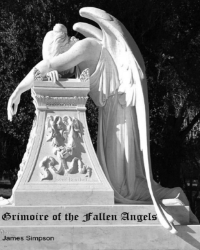 Have You Read "The Grimoire of the Fallen Angels"? The Grigori (from Greek egrgoroi, "The Watchers") are, in one popular version, a group of fallen angels described in Biblical apocrypha who mated with mortal women, giving rise to a race of hybrids known as the Nephilim, who are described as giants in Genesis 6:4. A different idea of the Grigori appears in some traditions of Italian witchcraft where the Grigori are said to come from ancient stellar lore. References to angelic Grigori appear in the books of Enoch and Jubilees. In Hebrew they are known as the Irin, "Watchers," found mentioned in the Old Testament Book of Daniel (chapter 4). Here, the "sons of God" are given no specific name or function; they could represent fallen angels, or simply heavenly beings that mate with women. The Book of Jubilees adds further details about the Watchers. While "Watchers" or "Sentinels" are mentioned alongside the "holy ones" in the Book of Daniel, it is doubtful they have any connection to the Grigori. The angels were fairly popular in Jewish folklore, which often describes them as looking like large human beings that never sleep and remain forever silent. While there are good and bad Watchers, most stories revolve around the evil ones that fell from grace when they took "the daughters of man" as their mates. In the early stellar cults of Mesopotamia there were four "royal" Stars (known as Lords) which were called the Watchers. Each one of these stars "ruled" over one of the four cardinal points common to Astrology. This particular system would date from approximately 3000 BC. The star Aldebaran, when it marked the Vernal Equinox, held the position of Watcher of the East. Regulus, marking the Summer Solstice, was Watcher of the South. Antares, marking the Autumn Equinox, was Watcher of the West. Fomalhaut, marking the Winter Solstice, was Watcher of the North. In the star myths the Watchers themselves were depicted as gods who guarded the Heavens and the Earth. Their nature, as well as their "rank", was altered by the successive lunar and solar cults that replaced the older stellar cults. Eventually the Greeks reduced the Watchers to the gods of the four winds. 1. Araqiel: taught the signs of the earth. 2. Armaros: taught the resolving of enchantments. 3. Azazel: taught the making of weapons of war. 4. Barqel: taught astrology. 5. Ezequeel: taught the knowledge of the clouds. 6. Gadreel: taught the art of cosmetics. 7. Kokabeel: taught the mystery of the Stars. 8. Penemue: taught writing. 9. Sariel: taught the knowledge of the Moon. 10. Semjaza: taught Herbal enchantments. 11. Shamshiel: taught the signs of the Sun. It is these same angels who are referred to as the Sons of God in the Book of Genesis. According to Christian belief their sins filled the Earth with violence and the world was destroyed as a result of their intervention. Richard Cavendish, in his book The Powers of Evil, makes references to the possibilities of the Giants mentioned in Genesis 6:4, being the Giants or Titans of Greek Mythology. He also lists the Watchers as the fallen angels which magicians call forth in ceremonial magic. Cavendish mentions that the Watchers were so named because they were stars, the "eyes of night." Christian theologians joined the Watchers to an evil class of fallen angels known as the principalities of the air. St. Paul, in the New Testament, calls the Fallen Angels "principalities": "for we are not contending against flesh and blood, but against the principalities, against the powers...against the spiritual hosts of wickedness in High Places". It was also St. Paul who called Satan "The prince of power of the air", and thus made the connection of Satan (himself connected to "a star", Isiah 14: 12 14) and etheric beings, for they were later known as demons and as principalities of the Air. This theme was later developed by a French theologian of the 16th Century, named Sinistrari, who spoke of beings existing between Humans and Angels. He called them demons and associated them with the Elemental natures of Earth, Air, Fire and Water. This, however, was not a new concept but was taught by certain Gnostic sects in the early days of Christianity. Clement of Alexandria, influenced by Hellenistic cosmology, attributed the movement of the Stars and the control of the four elements to angelic beings. Sinistrari attributed bodies of fire, air, earth, and water to these Beings, and concluded that the Watchers were made of fire and air. Cardinal Newman, writing in the mid 1800s, proposed that certain angels existed who were neither totally good nor evil, and had only "partially fallen" from the Heavens. In some Witchcraft and Wiccan systems the Watchers are beings who guard portals that link worlds together. Within such systems they are viewed as a spiritual race, a set of deities, or as spirits of the four elements. The Watchers are associated with the four quarters of north, east, south, and west. In some Traditions the Watchers are associated with the four elements of earth, air, fire, and water. They are also linked to each solstice and equinox, as well as to a specific star. In Charles Leland's book Aradia, or the Gospel of the Witches, he recounts the tale of "The Children of Diana, or how the fairies were born" in which it is stated that Diana created "the great spirits of the stars". In another legend titled "How Diana made the Stars and the Rain" Leland writes that Diana went "to the fathers of the Beginning, to the mothers, the spirits who were before the first spirit". Some Italian witches believe that the Grigori (Watchers) are such an ancient race and this reference may well speak of them. Over half a century following Leland's works, Gerald Gardner wrote of the Watchers and their connection to Wicca. In Wiccan religion the Watchers are evoked at quarterly "Watchtowers" to guard and witness the rites performed before them. In some Traditions each new initiate is taken to the four quarters and formally introduced to each of the Watchers. The Watchers are known by many names including the Old Ones and the Dread Lords of the Outer Spaces. In many Witchcraft/Wiccan traditions the Watchers are not only the guardians of the portals to other realms, but also protectors of the magic circle, and witnesses to rites. Each of the ruling Watchers oversees a Watchtower, which is now a portal marking one of the four quarters of the ritual circle. In Ancient times a "Tower" was a military fighting unit, and a "Watchtower" was a defending home unit, similar to a National Guard. • Armaros (also Amaros) in Enoch I taught men the resolving of enchantments. • Araqiel (also Arakiel, Araqael, Araciel, Arqael, Sarquael, Arkiel, Arkas) in Enoch I taught humans the signs of the earth. However, in the Sibylline Oracles, Araqiel is referred to not as a fallen angel, or Grigori, but as one of the 5 angels who lead the souls of men to judgement, the other 4 being Ramiel, Uriel, Samiel, and Aziel. • Azazel in I Enoch taught men to make knives, swords, shields, and how to devise ornaments and cosmetics. • Baraqel (Baraqiel) taught men astrology (from Enoch I). • Chazaqiel taught men the signs of the clouds (meteorology) in Enoch I. • Kokabiel (also Kakabel, Kochbiel, Kokbiel, Kabaiel, and Kochab), in The Book of the Angel Raziel, is a high-ranking, holy angel but, in general apocryphal lore and also in Enoch I, he is a fallen Grigori, resident of nether realms, and commands 365,000 surrogate spirits to do his bidding. Among other duties, he instructs his fellows in astrology. • Penemue in I Enoch 69.8 "taught mankind the art of writing with ink and paper," and taught "the children of men the bitter and the sweet and the secrets of wisdom." • Sariel (also Suriel, Zerachiel, and Sarakiel) is one of the 7 archangels originally listed in the Enoch books as Saraqel. Apocryphally, he is the governor of the zodiacal sign of Aries. In the Enoch books, he also teaches of the courses of the moon (at one time regarded as forbidden knowledge). • Samyaza (also Shemyazaz, Shamazya, Semiaza, Shemhazi, Semyaza and Amezyarak) is one of the leaders of the fall from heaven and is referred to in the Dead Sea Scrolls and Vocabulaire de l' Angelologie. • Shamsiel, once a guardian of Eden, in the Zohar, served as one of the 2 chief aides to the Archangel Uriel (the other aide being Hasdiel) when Uriel bore his standard into battle, and is the head of 365 legions of angels and also crowns prayers, accompanying them to the 5th heaven. He is referred to in Jubilees as one of the Grigori. In I Enoch he is a fallen angel who teaches the signs of the sun. The word "egregore" (also "grigori") is a transliteration of the Greek word, egregoroi, meaning "watchers". This word appears in the septuagint translation of the Book of Lamentations, as well as the Book of Jubilees and the Book of Enoch. Therefore an egregore is an angel, sometimes called watcher; in Hebrew the word is ir, and the concept appears in The Book of Enoch. Thus, Irim, the city of the Nephilim is again linked with the Book of Enoch, since the Nephilim, according to that Book, were the sons of the Irim (the egregores.). .Although the Irim, the egregores, are angels on both sides of the camp - fallen angels as well as faithful ones.